Cloves are immediately recognised for their ability to spice culinary dishes and for their analgesic prowess in reducing the pain of toothaches. They are the flower buds of the clove tree (Syzygium aromaticum). The buds are picked when they are still pink and then dried to a brown colour. The tree flowers throughout the year. Originally found in the Maluku Islands (Moluccas) of Indonesia, they are grown in Madagascar, Zanzibar, Pakistan, Sri Lanka and other countries besides India. 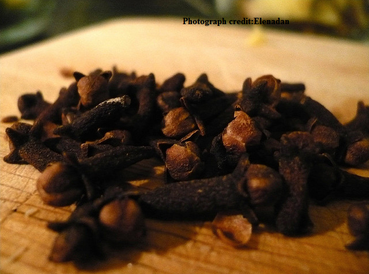 Cloves and the oil of cloves can both prove to be good remedies for nausea and vomiting. A mixture of 5 cloves, tamarind and sugar can provide relief in the case of morning sickness. A tea made from cloves is an excellent reliever of flatulence. Eugenol and a number of flavonoids in cloves give them anti-inflammatory and antioxidant properties. Cloves are a good source of vitamin K, manganese, calcium and magnesium. Cough and cold can be treated with a few drops of clove oil added to warm water mixed with honey. Clove oil can be used in combination with other ingredients to form a face pack to treat acne. Its anti-inflammatory, anti-microbial and antifungal properties make it an efficacious addition in treatment for skin diseases and fungal infections. It is said that a decoction of basil, mint and cloves taken with honey is a reliable anxiety and stress buster. Excess amounts should be avoided as it can produce adverse reactions. Eugenol in cloves is said to slow blood clotting so clove oil and cloves, apart from dietary additions, should be avoided by people with bleeding disorders and before surgery. Ingredients: 6 eggs, one large potato, one large onion, 25gm of peas, 25 gm of corn, 50 gm of chouriço (Goan sausage), ½ tsp dried mixed herbs, ½ tsp of salt, ¼ tsp pepper, 2 tbsp of oil. Preparation: Scrub the potatoes and cut thick slices with the skin on. Chop the onions. Fry the potato slices and chopped onion in the heated oil in a pan. Add the chouriço and let it all cook on low heat for 15-20 minutes. Boil the peas and corn separately and drain the water. Beat the eggs with the salt, pepper and herbs. Mix the potatoes, onions, chouriço, peas and corn with the egg and tip it into the pan which has been heated on a high flame. Cook for a minute and lower the heat to a low flame. Cover the pan for 7 minutes. Turn the omelette when the centre is cooked almost completely and let it cook for 3 minutes before serving. Ingredients: 12 slices of white bread (preferably stale), 500ml of milk, 2tsp of cinnamon powder, 6tbsp of sugar, butter, 4 eggs, 50gm of preserved/dry fruit and 75ml of heavy milk cream. 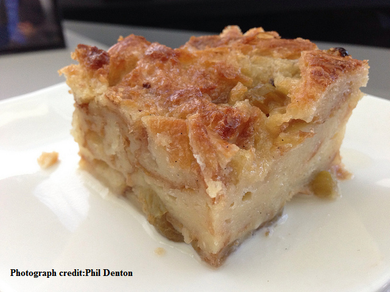 Preparation: Cut the crust off the slices, apply butter on the slices and cut them into half to form two triangles. Heat the milk and cream, stirring till the milk comes close to boiling point. Then take it off the stove. Whisk the eggs with 5tbsp of sugar till frothy. Stir the milk and cream mixture into the whisked eggs to create a custard mixture. Coat the oven dish with a thin coating of butter. Place a layer of buttered bread in the oven dish. After the first layer, sprinkle preserved/dry fruit and cinnamon on top and add another layer of triangles of bread. Continue this way until you finish with the triangles. After the last layer of bread, sprinkle nutmeg and the remainder of the sugar. Pour the custard mixture over the bread in the dish and leave it to soak in the mixture for 30 minutes while heating the oven at 180° C. Then let the preparation bake at 180 ° C for 20-25 minutes. One can obtain relief from constipation and piles by roasting cumin seeds and then grinding them into a fine powder. This powder should be taken with honey on an empty stomach. To get rid of a cold, boil 4tsp of cumin seeds and a 1 inch piece of ginger (crushed) in two glasses of water. Strain the water for a tea that should be drunk warm at least 4 times a day.